Sorry that I have not been on this site for quite a while. Life has a way of getting very busy and some things just fall to a lower priority. The reason for this post is the recent announcement that Tesla will be discontinuing the Lifetime supercharging program for Model S/X orders placed after January 1st 2017. It will be replaced with a program that will give 400 kWh annually. Any usage of superchargers above that level will be charged at a competitive rate. It is said that this will help in the expansion and upkeep of the supercharger network. Ultimately I believe that this is a good thing. I will however make sure that I take really good care of my Model S and drive it till the wheels fall off. Model S/X vehicles purchase before January 1st will all be grandfathered in with lifetime supercharging. The supercharger network was one of the reasons that I really wanted to purchase a Model S. This network allows for relatively quick long distance travel to just about anywhere you want to go (still no supercharger in Paducah though, please sometime soon Tesla). I have taken my S to Orlando, FL (via Indinapolis, Lexington, Knoxville), Chicago, IL and Cincinnati, OH. 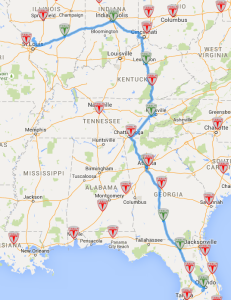 All these destinations were easily accessible because of the supercharger network. One great thing about it was the cost. I only spent money on human fuel (Diet Mountain Dew) and the cost of tire wear. I suspect in a few years when my 13 wears out I will look into a Model S that is one of the lifetime supercharger 16’s but until then I am very happy with my car. The Red Comet does everything I need it to do exceedingly well and I imagine it will do so for years to come. I got an email from the Tesla Mothership the other day inviting me to a social event this weekend. I suspect they are going to show us some goodies as well as giving us a look at features of a Tesla Model S that some of the owners of Classic Model S’s do not currently have access to. Today I took my first road trip after a snowfall. I had driven a very short distance after the last snowfall the last week of January and was convinced that I needed snow tires. I had in that short drive experienced a very long stopping distance with a very energetic ABS response. This is my first winter in my Model S and the first time I have had a car with RWD of any sort. The Primacy tires which are so sure footed in all other types of weather did not quite meet my expectations. I have been watching the Tesla Motors Club (TMC) forums and it’s discussions on the virtues of snow tires for several months. I heard of the various pluses and minuses of the numerous different brands of tires that other members had purchased. The consensus seemed to be that the Pirrelli’s offered by Tesla were not the best tires, especially at the Tesla price point. I have been a fan of Michelin’s since I got my first set of Defenders about 5 years ago. The X-Ice tires have a stellar rating on Tire Rack and among the members of the TMC. That pattern broke last evening. Defying the weekend’s forecasts a cold front blew in from the Northwest bringing with it measurable snowfall. I had a meeting in a little town about 50 miles away on a 2 lane state highway. Leaving the parking lot of my rectory with a little wiggle from the back end I hit the road. The state road was mostly cleared and I headed out of Brighton at 55 MPH. As i got just outside of town the Northwest winds had covered the roadway but for the preceding tracks of cars ahead of me. As the snow was blowing fairly hard I started to limit my speed and the rate that I accelerated from slowdowns. For the most part the trip was uneventful but I did find that I was very cautious as the snow covered roads became more frequent. The X-ice seemed to have good contact and were relatively sure footed but driving my very expensive vehicle during inclement weather was a bit nerve racking. I have since changed back to my All Season tires and I am very glad that the snow is behind me. I am glad that I got the X-ice tires but now know they are not a replacement for careful, cautious and responsible driving. Sorry it has been so long since the last post, life has a way of getting busy between my Parishes, Marquette Catholic High School, where I am Chaplain, and my own personal pursuits. As promised here is the next part of my trip to Florida. As I mentioned in the last post, due to some poor planning on my part, I was not going to be able to overnight in Tifton, GA. So having decided to make the journey in one night(day… ok 21 hours) I set off for the Supercharger(SC) in Knoxville, TN. The drive there was easy and I made it still feeling fairly good. This was the first place that I ran into a fellow MS driver. He was on his way North, I on the way South. We had a nice conversation before he went to a hotel and I went off in search of 5 Hour Energy at the Wal-Mart. Not only did I find 5 Hour Energy but the extra strength variety (Vile stuff, but it works)! After about an hour at the SC I hit the road for Atlanta. I did try to nap a little bit but did not have any luck. It was about 2:30 AM when I unplugged and got on the road for the Atlanta SC. I have a tradition of listening to Bruce Catton’s “The Civil War” whenever I head South of the Mason-Dixon line. I try to time it so that when I am going through Chattanooga, the site of the Battle of Chickamauga, the book is narrating the events of that battle. I just so happened to time it just right on this trip. I was quite surprised and pleased. It really helped me get through those early morning hours as my energy waned. I pulled into Atlanta about 5 AM, as I got more tired my average speed dropped as I knew my reaction time was not quite its best. The Atlanta SC is in a very large parking garage that is a bit of a labyrinth. Thankfully where my Tesla Nav left off I had Plugshare which gave me an approximate location. I plugged in and desperately tried to catch a nap. With a little shuteye and another 5 Hour Energy I hit the road. It was nearly 6:30 AM and I knew I had to get out of the Atlanta Downtown before it’s notorious traffic trapped me. I slipped out Atlanta and was on my way for the Tifton SC. Once I got outside of the metro area I put the cruise on 65 mph and began the long drive into the dawn. From here on out as the sun came out I started to get my second wind. I kicked the cruise control up to 70 mph and about 9 AM I pulled into the Tifton SC. This SC had a Starbucks, Olive Garden and a couple of Gas Stations with decent amenities. I got myself a little caffeine, a bottle of water and a protein shake. I also took a nice long walk just to shake off a bit of the rust from almost 16 hours in the car. The MS had enough charge after about 45 minutes to make it to the Lake City, FL SC. The drive to Lake City was fairly easy, the closer I get to Florida the better I felt. the Lake City SC does not have much to commend it. It is set at the back of a strip mall with untidy dumpsters in clear view. I did need to empty the garbage I had been but apart from that convenience did not see much that made this stop appealing. I caught a little more shuteye, surfed the internet and by 1:15 PM or so I had enough charge to make it to the Orlando SC. Again this was a fairly easy drive as the closer I got to my destination the better I felt. It took a couple of hours and I pulled into the Turkey Lake Service Plaza (the Orlando SC is on the Florida Turnpike) and intended to get a 100% charge so I wouldn’t have to charge during my time in Orlando. The Turkey Lake Service Plaza is really a good SC stop. There is plenty of room to take a stroll, a couple of shops to pick up drinks and snacks, 3 restaurants. I picked up some milk (8 grams of protein per 8oz. serving) and settled in for an hour and a half. Debi (my MS) got to about 99% and I figured that would be enough for my time in Orlando. I finished charging around 4:30 PM and then headed off to the resort. I spent a little over 21 hours in the car driving a little more than 5 hours and change charging. 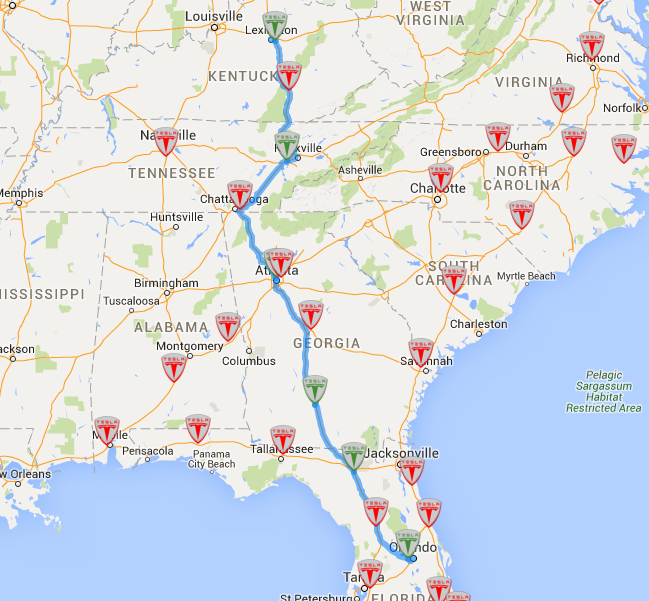 By far this was the longest drive to Orlando that I had undertaken. I so look forward to the I-24 Corridor out of Saint Louis to Nashville to get built out. It would take at least 4 hours out of that drive. If I ever choose to take the route again that I used this time I will overnight in Knoxville, lesson learned. Well that is the completion of my Journey from Brighton, IL to Orlando, FL. 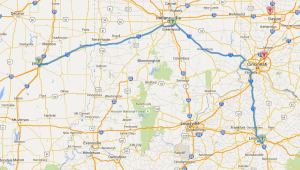 So I hopped into the Car and jetted off to the Indianapolis Supercharger. The trip was again slowed down by construction eastbound. Once past the construction zone I was up to the speed limit and via the trip Energy Meter was well within the range needed to get to Indy. I generally on this trip tried to keep the reserve at around 10 percent. I must have had a tail wind because rather than declining throughout this leg of the trip the reserve predicted at the end was going up, sometimes even to 14%. I made it to Indianapolis and I knew I would be there for about and hour to get me to the Lexington, KY SC. I got out, stretched and headed into the hotel for a rest stop. There was a gas station next to the hotel, but having stopped in there before I decided it had nothing to interest me. I had also packed provisions for most of the journey so after about 20-25 minutes I got back into Debi (my MS is the first car I have ever named). I figured I would put my final destination for the first leg of the trip into the trip planner and see what Debi had in store for me. When the Nav finished crunching the numbers it had me getting to my overnight point at 8:47 AM. Needless to say I was very unhappy and surprised with this. I double checked with EV Trip Planner and came to the reluctant realization that I was not going to overnight in Tifton, GA. I called the hotel to cancel my reservation so I could get someplace closer. They of course had a midnight cancellation policy, so there went $110 wasted. Here, though I had initially decided against it, I resolved that I would drive straight through to WDW. Having done the trip to Florida a number of times, I thought one more time would not affect me much. I got a 95% charge at Indy and was off again. I got to the Lexington, KY SC and knew I would again charge to 95% to get to Knoxville, TN. There is a Meijer’s store there so I went hunting for something to eat and possibly drink. I also took a rest stop. I probably was there for about 30 Min. I spent about 10 minutes of this searching Meijers’s for 5 Hour Energy, which they did not have. On a different note when I pulled into the SC I plugged into the 1A Charging Station. I got a red charge port ring. I was not too distressed and just moved the car to 3A where it charged successfully. I called Tesla and let them know, they said thanks and would have someone out to check on it the next day. I had a couple of days off work before I was released by my physicians to return to normal duties. I decided to take a short trip to Florida. 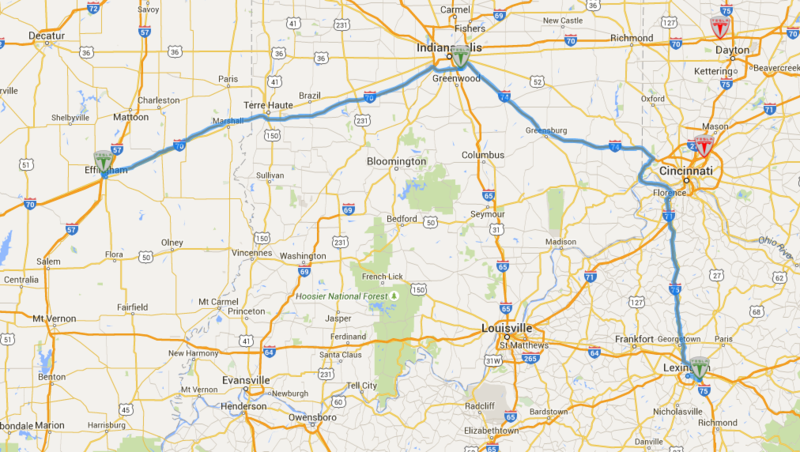 Now a short trip to Florida from south central Illinois via car is just a little bit nuts. I really do not like to fly, not because of flying but because of the nonsense that is the Transport Safety Administration (TSA). I have made this trip to Florida in about 17 hours straight using an ICE(Internal Combustion Engine) vehicle. 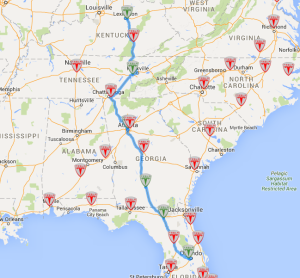 This time though I was going to use my Tesla Model S. Below you can see the route I took. Unfortunately the Supercharger network has not yet been built out on the I-24 corridor. Thus I had to go a little north and further east than in a normal trip. For once I wasn’t going to Iron Man the drive. It is really amazing to me what difference a year makes but I didn’t think I had a Florida in a single hop trip in me. Looking at the Supercharger(SC) route provided by EV Trip Planner I figured it would take around 24 constant hours not including charging stops to get from my house to the SC at thee Turkey Lake Service Plaza on Florida’s Turnpike. 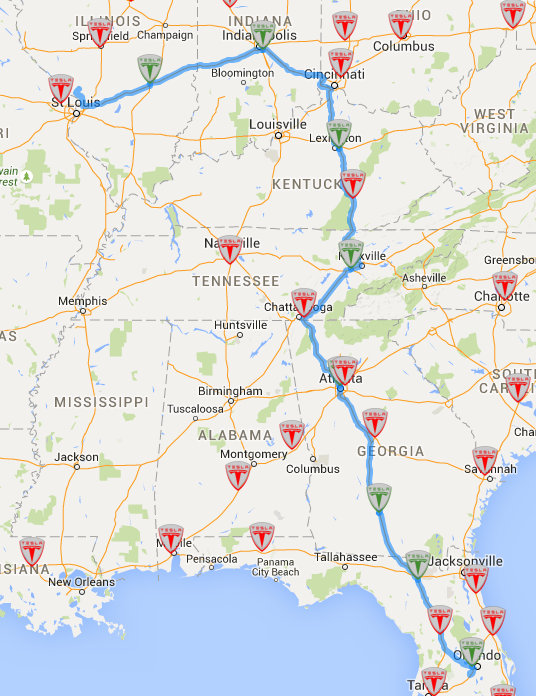 The Tesla Route Planner figured it would be about 26 hours with Charging stops included. I hopped on the road about 11:45 on Sunday and went to hit the Effingham, IL SC. The Route Planner in the current version of the Tesla Firmware is a bit buggy. It wanted to send me to the Saint Charles, MO SC even though I had more than enough juice to get to Effingham. I then did what many Tesla Owners have done and manually edited the route by taking all charging points out of the route. The car’s software is clever enough to figure out what energy reserve you will have at your next stop. So I started breaking the trip in the planner into small chunks so I would only get the SCs that I wanted. This is a tedious process but it worked quite well. I look forward to the day when we can remove individual SC points rather than all the points on a complete trip. I got onto the road and put the cruise control at the posted speed limit and was on my way. I got to Effingham in about 2 hours (CONSTRUCTION ARGH!) and plugged into the SC there. One of the real pluses about SC travel is a built in rest stop every 2-3 hours to refill the battery. The gas station there has a great quick shop and really clean restrooms. I wandered around a few minutes, then decided I didn’t need to get anything and headed back to the car. I then got out my laptop and wrote a short article for our Parish Bulletin that I would normally write during the week. When I finished it the car was ready for the next step in the journey, the Indianapolis SC. I wasn’t yet paying attention to the calculated arrival time for my overnight stay… more on that in my next post. A new piece to the puzzle. The Tesla Model S is an engineering marvel and a thing of beauty. It really doesn’t need much but an occasional bath ( Just did my first hand-wash last night since I was a teenager). But low and behold from Amazon there came another piece to the Model S puzzle. 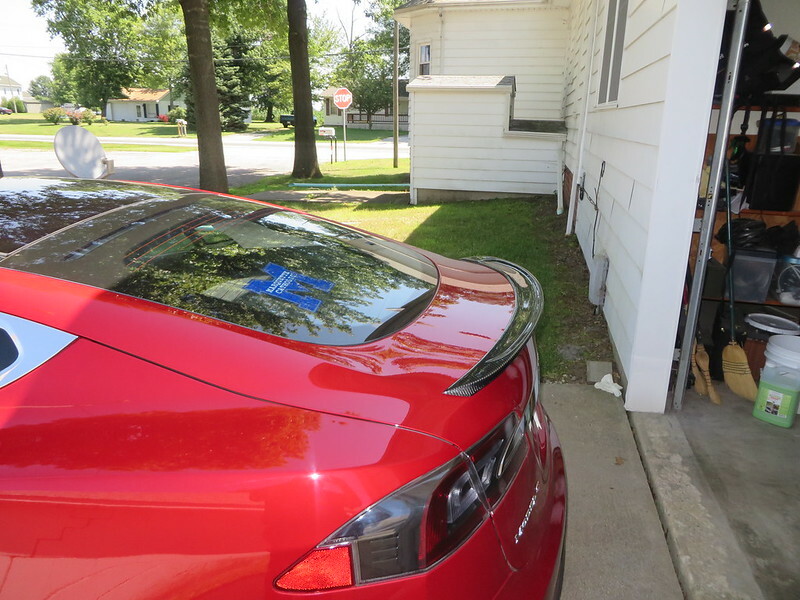 I really admire the look of the P85 with its Carbon Fiber spoiler but from Tesla it is a $1000 option (URK). Also because my car is not a performance model Tesla will not install it on my vehicle. 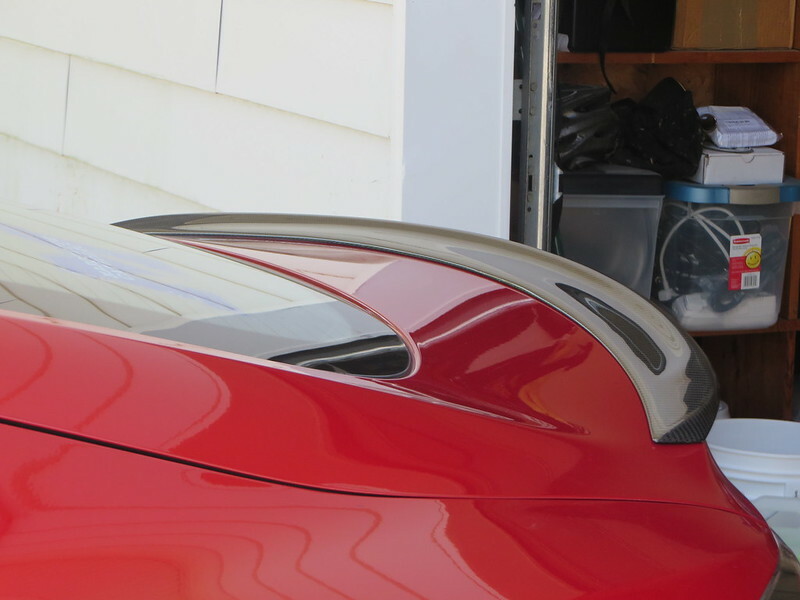 Well I was watching the forums over at Tesla Motors Club and someone found a CF spoiler for less than $300. This really peaked my interest but I put it on my Amazon wish list for a later day. I just happened to be viewing my wish list when I saw the price had dropped to $153 with free shipping. Throwing caution to the wind I hit buy it now and about 10 days later the spoiler showed up. 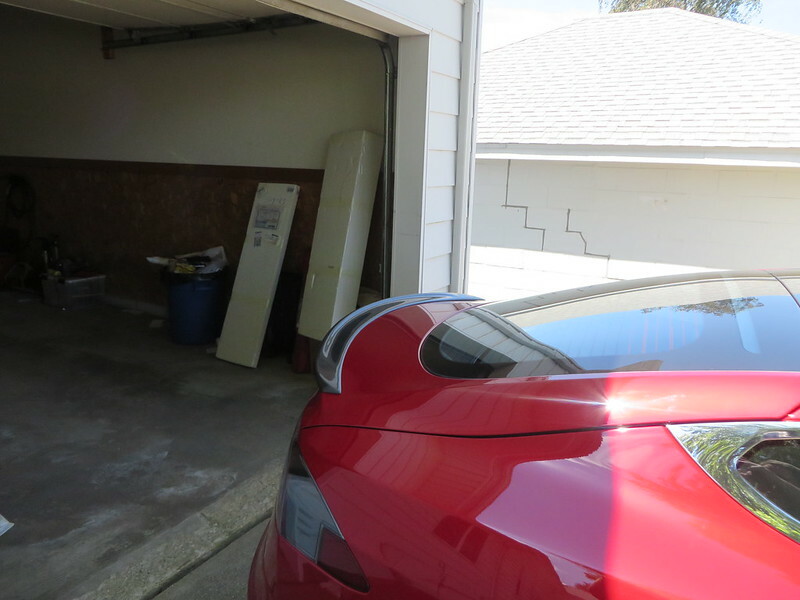 The spoiler looks almost, if not exactly, identical to the Tesla OEM part. With the help of some friends I installed the Spoiler today. Here are some pics for your enjoyment!